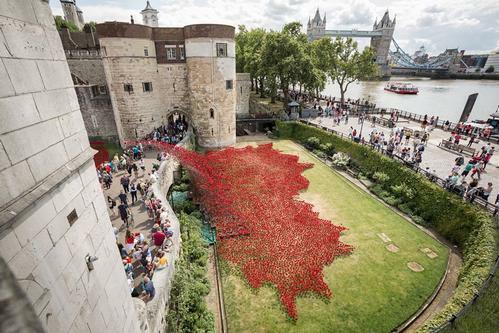 01 January 2015: In July a volunteer placed a single ceramic poppy in the moat at the Tower of London. Less than four months later the landmark was encircled by hundreds of thousands of the flowers, producing a spectacular display that captivated the nation and has now seen its creators honoured by the Queen. Paul Cummins and Tom Piper, who were behind the Blood Swept Lands and Seas of Red installation, are both made MBEs in the New Year honours list. The exhibition saw 888,246 ceramic poppies progressively fill the moat at the Tower, one for each British and colonial military fatality during the First World War, between July 17 and November 11, marking the centenary of the outbreak of hostilities in 1914. More than five million people flocked to see the memorial, including the Queen and Duke of Edinburgh, and Princes William and Harry. The monarch underlined the artwork's popularity and impact by referring to it in her annual Christmas address last week. She said: "The ceramic poppies at the Tower of London drew millions, and the only possible reaction to seeing them and walking among them was silence. For every poppy a life; and a reminder of the grief of loved ones left behind."